A highly valuable resource for new, aspiring and even seasoned bloggers, this ebook is a must-have for the entrepreneur’s library. Why? Because it is a step by step how-to-create-a-successful-blog formula. Even if you have been blogging for some time, I am guessing there are steps that Holly recommends that you’ve never considered. Section one really takes you through the basics of successfully creating a blog with staying power. So if you are in the idea or early stages of blog development, this is where you will likely begin. The more seasoned blogger might even discover some fresh ideas to add a new spark of life to her presentation. My favorite section was by far Holly’s tips for how to drive more traffic to my blog. We all dream of monetizing our blog at some point, right? And developing your blog to that level is a meaningful goal. But as Holly clearly points out, it all begins with building an audience. Highlights on traffic building for me include Holly’s tips on Alltop, Su.pr, Scribd, and her top list of possible feature or interview resources. Once you have established a presence in your niche market, it’s time to think about how you can actually turn your blog into a revenue source. According to Holly, “If you plan on making money from your blog, you need to treat it like a business.” Wise words, which you will have to heed while you work your way through the amazing checklist within this section. Full of creative and tangible tips you can begin to implement immediately, you will want to take your time here. As if Holly’s success wasn’t testament enough for the strategies in this ebook, she includes five inspiring stories from women bloggers within her network. Not only are there links to connect with these additional resources, but honest statements about the hard work, and lessons learned throughout their blogging experiences. 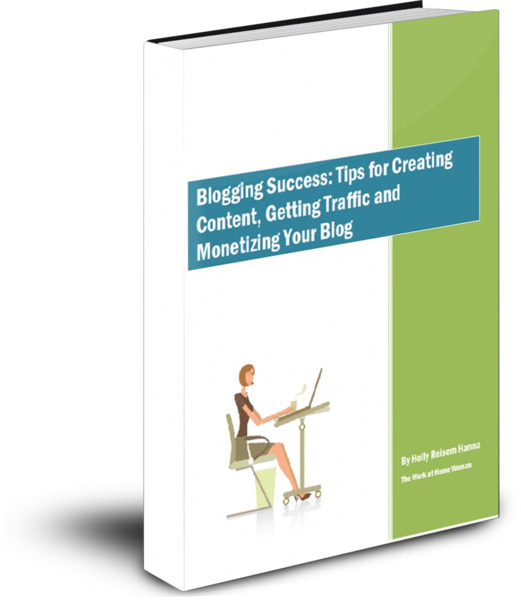 Holly’s extensive research on how to build an audience for, and monetize her own blog is the foundation for this exciting ebook. My purpose for this post was to share the value I discovered within the pages. To get all the juicy details you’ll have to grab your own copy of this ebook. 🙂 And I hope you will. For a limited time, Holly is generously offering my readers $10 off the purchase price of this ebook by using the promo code THANKS. So don’t wait! CLICK HERE to grab your copy today and start successfully leveraging all the hard work you pour into your blog. This entry was written by Dr. Shannon Reece, posted on October 21, 2011 at 5:00 am, filed under Book Review and tagged blogging, Holly Hanna, Monetizing your Blog, small business tips, strategies for women, The Work at Home Woman. Bookmark the permalink. Follow any comments here with the RSS feed for this post. Post a comment or leave a trackback: Trackback URL.